Since realizing that making sichuan food at home is easy and do-able i decided to tackle other restaurant-only dishes. so, DIM SUM. i am very lucky that there is vegan dim sum in Vancouver and I can go fill myself with buns and gluten for about 10 dollars but i wanted to see what was within my own culinary reach. 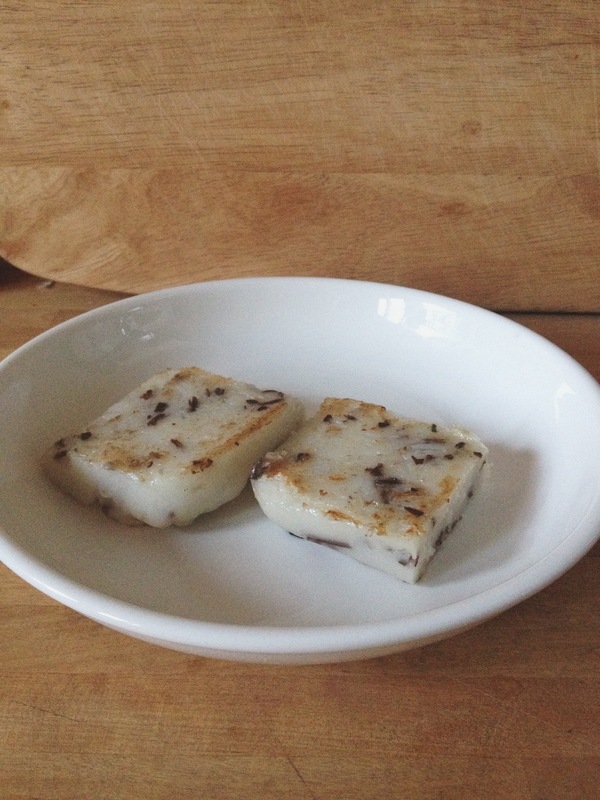 First test was turnip cake, a dim sum favourite of mine. Peel and grate the turnip into a bowl and put aside. finely slice or chop the mushrooms, discarding any hard bits. in another bowl mix the cornstarch, rice flour and water and whisk until smooth. Get a pot of water with a steamer ready! Meanwhile, heat a couple tbsp of oil in a wok and once hot add you mushrooms. cook for a minute or two and then add the turnip, moving it around until it starts to cook (5 minutes-ish). add the salt, sugar and pepper and cook for another minute. add the batter and keep moving it around, scraping up the bottom. it will start to thicken and once it does it will thicken very quickly! once it thicken to an oatmeal sort of consistency take it off the heat and scrape in a rectangular glass dish or 2 smaller bowls. Steam for 30-40 minutes or until firm to the touch. cool slightly (you can refrigerate at this point also). slice into 1/2-1 inch slabs, you may need to oil your knife to get nice clean cuts. heat a tbsp of oil in a frying pan and add the turnip cake, probably in 2 batches as to not crowd them. cook until golden, flip and brown the other side. serve immediately with dipping sauce (i do one with light soy and one with chili paste). that’s it!